THE old wooden water-cart will be rapidly superseded by a perfectly-constructed iron tank fixed on the framework of a specially-fitted cart. The tank, besides containing a larger supply of water, is not liable to leakage, while the span of its perforated tube behind, and the force of the water discharged, are all admirably adapted for the efficient watering of roads. Independently of the rain which frequently cleanses the metropolis, and the gentle showers that lay the dust, the enormous quantity of water annually poured on the roads of London constitutes an important drain upon the water supplied to the metropolis. The men employed on the water-carts work according to the state of the weather. Thus, in summer under a hot dry wind, they emerge at early morning from the vestry yards and radiate over the parishes. During wet weather some are employed in cleansing the roads, others in carting materials for the contractors who supply the building trade. These are the hands who find constant employment under one master at weekly wages ranging from eighteen to twenty-three shillings. 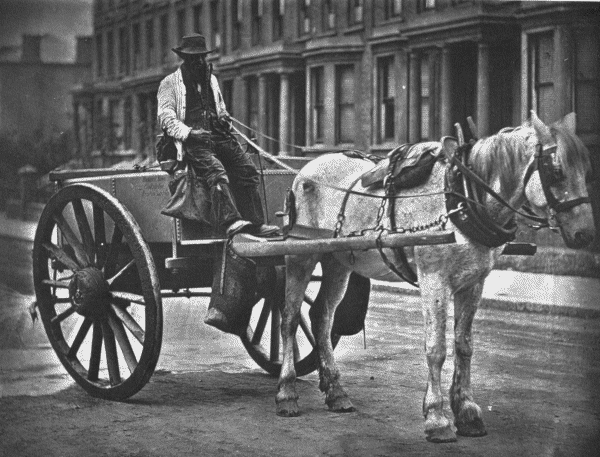 In justice to the contractors, I must express my admiration of the carts men, and horses used in this branch of road labour. The accompanying illustration is a fair specimen of the modern water-cart and its accessories. The cart is, I believe, protected by a patent, and is assuredly of the most novel construction. The horse is typical of the class of animal used for the work-large and powerful, so as to stand the strain of incessant journeyings two and fro, and of the weight of water in the tank. The man is a fair type of his class, being attired in a manner peculiar to watering-men. Beyond the ability to groom and manage a well-fed docile horse, nothing approaching skilled labour is required. He sits on his perch all day long, only descending when it is necessary to refill his cart at the hydrants. "I may say, sir, I have no proper home. My father and mother are both living. But mother for many years has done all the work." He modestly confessed, a blush mantling his cheek, to helping his mother. He indeed gave her regularly the extra three shillings of his weekly earnings. "As to my father," he continued, "I had to leave home on his account. I quarrelled with him, and never could have saved a penny while I lived under his roof. I had a small cash-box containing my savings - some three pounds odd; my father one morning broke open the box and helped himself to one pound. I never could feel the same to him after that, I felt savage and sorry too. So I left the old people, and took a lodging not far off. My mate, in the same employ, and me, pay half-a-crown a week each for one room, washing, and cooking. It must pay the landlady, because we are no trouble. She cooks, we buy the meat just as we feel inclined. My washing is not heavy-two shirts, two pairs of stockings, one slop jacket, and the kerchief I have about my neck. It costs me, all told, about twelve shillings a week for my living, the rest I mostly save. I have laid by about eight pounds this last twelve months; I mean to put it in the bank, that, please God, when I am old, I may need no man's help." It is refreshing to come across a man of this stamp, kind-hearted, independent, and steady. "If I have ever done any good," he said, "it's my mother I have to thank for that. She managed to keep us straight when we could do nothing for ourselves, and when things looked black enough." Another weather-beaten waterman told me he had been off and on twenty years with the cart. In his young days he served a corn-chandler. "But the hours was killing; and my gov'nor would ha' took more if he could. Seventeen hour a day sometimes, what do ye think of that ? I left when I got this job, waterin' in summer, and cartin' in winter." I remarked on the fine condition of his horse. "Bless ye, yes," he said; "you see, sir, my family is all grow'd up like and away, and I takes to this beast uncommon." I said that he was uncomplimentary to his family. "Not a bit, not a bit! Some on em ad not the manners o' that beast, but they was mainly good. That os knows my and as well as if he war a dog; he knows my foot too, and w'en I wakes im he pricks up is ears, and a'most smiles he do w'en I says a cheery word. I believe that os understands all I say, and if he could speak would give me as good a character as my master. But I don't want no new place, I am comfor'able, e and I gets on like brothers. That is the os for me."